Thank you to all the pupils, parents and grandparents that participated in our CHSA Queen’s Official 90th Birthday Celebrations on Friday. 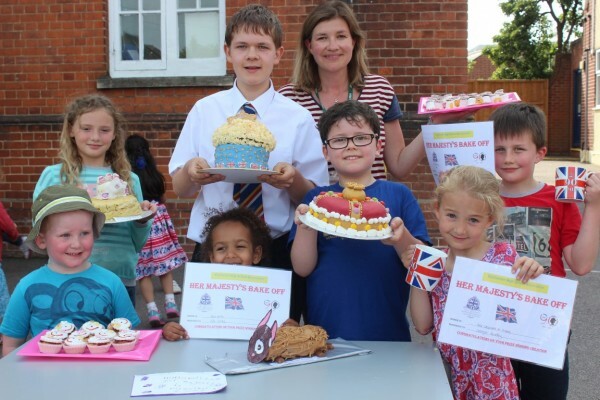 Cake mixers must have been wheezing late into the night given the tremendous response to the ” A Cake Fit for a Queen” Bake Challenge which provided us with a fabulous assortment of incredibly decorated cakes, biscuits and scones for the afternoon tea. Mrs Cryne (Admissions Registrar) and Mr Need (Thomas Franks Catering) ere given the unenviable task of judging the bake competition which they took incredibly seriously. Mrs Cryne said, “There were so many wonderful cakes on offer and it was really hard to choose the winners. They not only looked amazing but tasted good too”. Overall winner and best in show went to Jacob in Year 3. Mrs Cryne and Mr Need chose this cake as they found it “captured the essence of the theme”. Jacob had worked on the cake with his grandmother and they had produced a fabulous reconstruction of the Coronation Crown. Thanks go to the CHSA executive for organizing such a wonderful afternoon. Please click here to see votes of our patriotic, fun and scrumptious celebrations!